Disclosure: I received one or more products for free for review purposes only. Despite the free item, my opinions remain 100% Honest and my own. 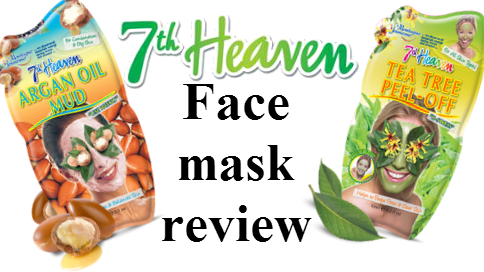 This is my review on the 7th Heaven Tea Tree peel off mask and the 7th heaven Argon oil mud mask. It's taken me a while to complete this review because when I did the Tea tree peel off mask I broke out in cystic acne for the first time in my life. After having it for about 2 1/2 weeks I had to go to the doctor and get antibiotics to get rid of it because the whole left side of my face swelled up. I cannot be positive the mask is what caused it. I will say that the same night that I tried it I also tried it on another person because there was enough product for 2 people and they did not have the reaction that I did. I did like the way the mask felt I liked the smell and texture. It just didn't work for me. You're supposed to put a thin layer on your clean face leave it on for about 20 to 25 minutes and then peel it off. The mask sells for $1.99 and it's available at Walmart, bed bath & beyond, Harmon discount and Kmart. This mask is for de-stressing. The tea tree oil is supposed to help with blemishes. This is a one time use product. I would not use this mask again and if I recommended it I would recommend it with the story of what happened to me. Moving onto the argon oil mud mask this mask is made for combination and oily skin and it is supposed to deep cleans pores, balance oil levels and revives tired skin. You put on clean skin for 10 to 15 minutes and then rinse off. It is also available at Walmart, bed bath & beyond, Harmon discount and Kmart. This is a one time use product. First I would like to comment on the smell, I hated it. I had never used a mud mask before. I like the way that it felt like the way that it dried. My skin did feel very clean after I rinsed it off. I did not have a bad reaction with this mask and I would use it again. I can get over the smell if it works good! Thank you for watching my review on the 7th Heaven Tea Tree peel off mask and the 7th heaven Argon oil mud mask. You can also find them at Walmart this holiday season! I absolutely love these masks, I love going into the store and picking up all types. My face seems to react the best to the peel off mask than the wash off masks. So sorry to hear about the mask reaction, glad it's cleared up. I will definitely be cautious when trying it out.